Below is a list of some of our most asked questions. If you do not see an answer to your particular question, please feel free to email or call us, and we would be happy to help you find the answers you’re looking for. Where are the hot springs? Jemez Springs is beloved for its mineral rich hot springs, which derive from its neighbor to the north, Valles Caldera National Preserve – a national park. One of only six super volcanoes in the world, the Valles Caldera is what resulted when a series of volcanic eruptions occurred more than 1.25 million years ago. Underground geothermal hot springs flow downward to the Village of Jemez Springs providing year round opportunities for hot springs soaks. Outdoor enthusiasts can hike along several forested trails in the Jemez Mountains and take a dip in natural primitive hot springs including: McCauley Hot Springs, San Antonio Hot Springs and Spence Hot Springs. For a relaxing experience, commercial bath houses in the village such as Jemez Springs Bathhouse and Jemez Hot Springs are welcome alternatives. Where can I stay the night in Jemez Springs? To truly relax and unplug, an overnight stay in Jemez Springs is a must. A wide variety of accommodations are available in and around Jemez Springs. Rates vary depending on season. Note: in the interest of maintaining a quiet and retreat like atmosphere for guests, some lodging facilities do not allow young children or pets. Please visit individual websites or call for more information and policies. A directory of places to stay in the area can be found on the lodging page under Eat & Stay Here > Lodging. Where can I find free internet access? Our visitors come to Jemez Springs to unplug and reconnect, but that doesn’t mean that the village is without internet access. When you want to access information, maps or just want to check your email, the Jemez Springs Library offers free internet access via its public computers as well as a wifi hotspot for laptop users. Several local business also provide wireless internet to their patrons as well. Where is the nearest gas to Jemez Springs? Nearest gas is 9 miles south at the Walatowa Convenience Store, just north of the Jemez Pueblo (Phillips 66). Next gas station (heading north on Highway 4) is in Los Alamos, about 45 miles to the east. 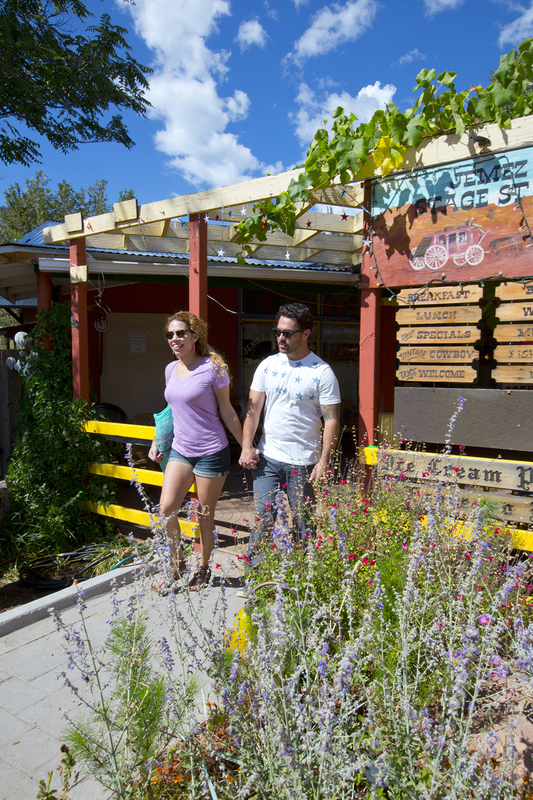 Where are the ATMs in Jemez Springs? The Jemez Valley Credit Union has an outdoor 24/7 CU Anytime ATM cash machine. There are also ATM machines inside Amanda’s Country Store (9 miles north in La Cueva), The Trail House Convenience Store (7 miles south), and at the Wallatowa Convenience Store (10 miles south). What's the weather like in Jemez Springs? Jemez Springs is a mountain village, so summers are comfortable with temps ranging from the low 50’s to upper 80’s and winters temperatures range from the low 20’s to mid 50’s. View our Weather Page for the seven day forecast, diagrams of our average rainfall and temperature, and links to the National Weather Service site. What's happening in Jemez Springs? 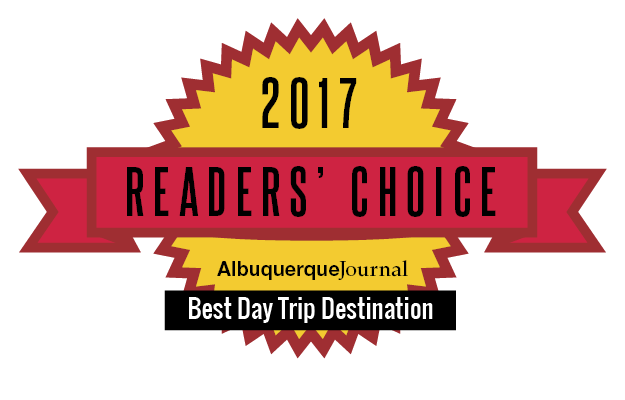 From annual festivals to year round cultural and outdoor events, there is always something to do in Jemez Springs. Outdoorsy types will gravitate towards the many hiking and soaking opportunities in the area including around Soda Dam, Battleship Rock, and in and around the Village. Those who love Native American culture can take a self guided tour along the 1.5 mile trail at Jemez Historic Site or experience the spiritual ceremonial dances or events that take place in August and October. Those looking to kick back and unplug from busy lives can schedule a facial, massage or hot springs soak at Jemez Hot Springs, Jemez Springs Bath House or Canon del Rio. In addition, a list of upcoming events or annual festivals can be found on our events page, click here. What is the history of the Jemez Valley? For those who are new to Jemez Springs, the village feels like an undiscovered gem. But with so many geological and cultural attractions in the area, what attracts visitors and residents to Jemez Springs today are the same features that have brought the area’s original inhabitants here for centuries. Information about the Jemez Valley can be found on the Jemez Springs Public Library’s site, www.jemezvalleyhistory.org. Information about Jemez Pueblo and its ancestral culture can be found at www.jemezpueblo.com. What is the population of Jemez Springs? According to the 2010 U.S. census, there are approximately 250 full time residents who live in the Village of Jemez Springs. What makes the Jemez mountains so red? The reddish, terra-cotta colors you see in the Jemez Mountains and mesas are due to oxidized iron, or ferric oxides, that coat the mineral grains that make up sandstone, siltstone and shale. How close is Valles Caldera National Preserve? Jemez Springs is the gateway to the Valles Caldera National Preserve – one of only six super volcanoes in the world. Valles Caldera is approximately 17 miles north of Jemez Springs along Highway 4, the Jemez Mountain Scenic Byway. All 89,000 acres of the preserve are within Sandoval County and easily accessible via scenic mountain drive from Jemez Springs. Valles Caldera is home to New Mexico’s second largest elk herd, so those who love viewing wildlife will be attracted to the area especially during rutting season when the colors start to change in the area. There are dozens of hiking trails within the park for summer hikes as well as cross country skiing in the winter. Jemez Springs is a great base camp for a visit to the park. What is there to do for families? Jemez Springs is sought after as an escape from the noise and business of the bigger cities, and everyday distractions. Jemez Springs welcomes families though, please note, some lodging establishments geared towards relaxation and quiet do not allow children under 10 years old. The same policies apply with commercial hot springs. Please inquire with individual facilities on policies. There are many awe inspiring activities that invite curiosity and bring families together for memorable experiences in Jemez Springs. What better way to teach a child about Native American history of the area than a walk along the ancient ruins of Jemez Historic Site? Kids will love fishing along the Jemez River or Fenton Lake State Park and will enjoy a walk along Soda Dam, where hot springs flow from the Valles Caldera. A short hike near the 200 foot Battleship Rock formation provides hiking, fishing and picnic opportunities as well. And what better photo opportunities of your little ones or once-little ones than against the backdrop of the red rock mesas near Jemez Pueblo and Virgin Mesa in the Village? Plus, ever hear about sighting of Big Foot in the Valles Caldera and Jemez Mountains? You’re sure to learn more by talking to locals, and one place locals love to hang out at is Los Ojos Saloon and Restaurant. For suggested family friendly itineraries for multi-generations, click here. What is the altitude of Jemez Springs? Within the Jemez Springs Village limits, the elevation is 6,198 feet. But elevations can quickly change once in the Jemez Mountains. In fact, the highest elevation in the Jemez Mountains is 11,562 feet. It is advisable for those not used to high altitudes and when hiking or soaking to drink lots of water to stay hydrated and layer clothes. And take it slow! Is there access to Jemez Springs from the NM Railrunner? The Rio Metro Regional Transit offers access at various times during weekdays only from several locations in Sandoval County including from the US 550 Rail Runner station in Bernalillo, NM. A full schedule and map of pick up locations is available at: https://www.riometro.org/images/pdf/bus-routes/sandoval/route-204.pdf. See Route 204.